Scandinavian style dining room furniture is simple and timeless. Opt for pale colour materials paired with white for freshness. If teamed with simple decor like white washed walls and floor boards, you can achieve that effortlessly cool look. I spotted a fabulous collection of furniture at Cox and Cox to tell you about. With a beautiful dining room table and the option to buy coordinating chairs or low stools, you can tailor the range to suit your needs. The Aalto collection also includes bar stools and a console table. So let’s take a look at this lovely Scandinavian style dining room furniture. The Aalto collection from Cox and Cox is definitely worth checking out if you’re looking for a new dining room furniture arrangement. The large rectangle shaped dining table looks like wood but is actually made from carbonized bamboo. This means it is very durable and also sustainable. The carbonized bamboo is left untreated which you can protect with oil. The shape has a mid-century modern vibe with soft edges and tapered legs. 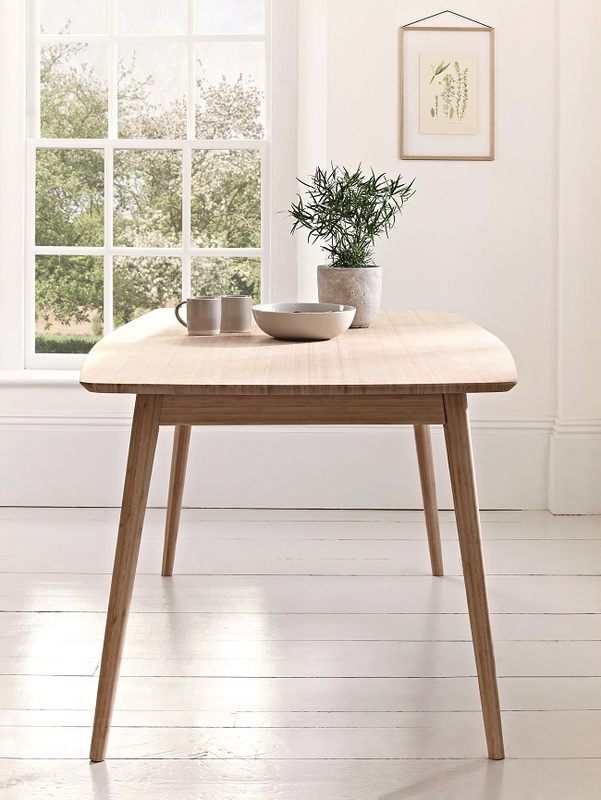 The table can sit four people so is ideal for a small to medium sized dining room or kitchen diner. Measurements are 74cm high, 160cm in length and 85cm in width – £425. Product code: H-ALTTBL. If you matching chairs to coordinate with this table, you’re in luck. The Aalto range also features dining chairs which you can buy in pairs or as a set of four with the dining table. The seat is made from polypropylene which has been moulded so that the seat itself has a wide base while the back is curved and supporting. The four angled tapered legs are crafted from the same carbonized bamboo material. The measurements are 87cm high, 45cm wide and 57cm in depth – £200 for a pair. Product code: H-ALTCHAIR2. If you’d prefer stools with your dining table, you’ll love the Aalto Low Stools. These again have the white polypropylene seat paired with the carbonized bamboo legs which are tapered. You also get resting rungs for your feet. You can buy these separately or with the table as a set. The measurements are 49cm high, 38cm wide and 38cm in depth – £120. Product code: H-ALTLOWSTL. You can also buy Aalto Bar Stools. These are taller versions of the low stools. This is a great option for those with a kitchen diner who want to be match their dining table and chairs with breakfast counter seating. You get two different height rungs for resting your feet which is pretty neat! Measurements are 69cm high, 43cm wide and 43cm in depth – £150. Product code: H-ALTBARSTL. Those requiring additional counter space might the Aalto Console Table. This furniture piece can be located in the hallway, living room, bedroom, dining room and kitchen. If placed in the dining room you can use the drawers for cutlery and the top for crockery. The drawer is nice and wide and the slatted shelf at the bottom gives you additional storage space. The measurements are 80cm high, 90cm wide and 35cm in depth – £220. Product code: H-ALTCONSOLE. If you want to buy the dining room table with four chairs the price is £825, the product code is H-ALTSETCHAIR. If you want to buy the dining table with the four low stools the price is £900, the product code is H-ALTSETSTL. Alternatively, you can buy the table and match with white painted chairs from junk shops or revamp existing chairs you already have with a lick of white paint. The Aalto furniture collection is available to buy online from Cox and Cox. This online interiors shop sells furniture, home accessories, decorative objects and gifts for the home. It’s a great website to browse for simple and stylish items. Author: Homegirl London. Photographs: Cox and Cox. Disclosure: This feature includes the following affiliate partners – Cox and Cox (if you click through from my website and purchase items from the affiliates I will earn a small commission).